I finally bought the digital camera I longed to own! Hooray! I'm so glad to finally have it! There are reasons for which I bought this camera, but that's for another time. First off, what to photograph?! I took a lot of photos, but I figured for this post I'd put up a number of miscellanea I own. Incidentally, the functions of my camera are excellent. So it's me who's not good at taking photos. Snakes and sharks are not popular creatures in our world, so it makes me sad how few items I can find. 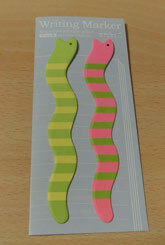 The first picture is of these snake markers. They've been getting some action lately. I write plans and such on them and stick them on my PC. Second is a snake... toy? Sometimes I put it on the windowsill to get a nice view. The pixel count of my new camera is 1.6 megapixels, so it's very nice quality. But using the flash correctly is difficult... It goes all white whenever the subject is remotely shiny. My favorite is the sitting one on the right. Next, shark goods. The most numerous. I mainly got these at aquariums. 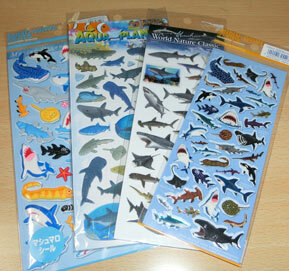 Here we have shark stickers. Not often sold at stationery shops. There's shark reference sheets on the backs, which is neat. On the right is a shark made of glass. In the middle, a bull shark badge. 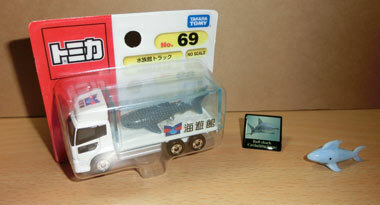 Incidentally, it's a whale shark. The front one's hands are frizzy, and it looks somewhat off when the light hits it. 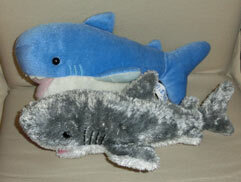 Actually, I have three other sharks. And they're even bigger than this. For now, I've taken a satisfactory number of photos. Next time, I want to post some outdoor photos. Ah, yes, the primary reason for buying this camera. I was planning to go to Tokyo, and in fact did last month. Of course, I took tons of photos there, so I'll likely put them up soon. As for why I went to Tokyo, it was to see goldfish. Thus, most of the photos are of goldfish. Come back to see them if you like. 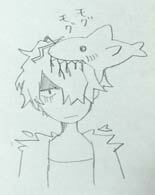 Garry being devoured by a shark. I took this with my new camera as well.